The combined rise in chronic, noncommunicable diseases and continuing burden of infectious diseases has highlighted the need for strengthened health systems in low- and middle-income countries. A robust health system is necessary if the Sustainable Development Goals (SDGs) are to be achieved;2 it is also central to designing, implementing and monitoring health programmes; delivering quality health services; and ensuring universal health coverage. Strong health systems will need adequate and well-trained health professionals, and a shortage of health workforce can often be a crucial limiting factor in the delivery of quality health services in low- and middle-income countries. Public health is a vital part of any health system and is ultimately responsible for reducing health risks and maintaining and improving health status. Consequently, as noted in a United States of America (USA) Institute of Medicine report, public health professionals play a pivotal role in the creation and maintenance of a healthy community. This report defined a public health professional as “a person educated in public health or a related discipline who is employed to improve health through a population focus”. Public health is a fusion of many cross-cutting disciplines, including but not limited to: medicine, behavioural and social sciences, statistics, management, communication, environment, nutrition, law, and public policy. An emerging economy like that of India has to plan for adequate access to quality health care for its large population. There is a recognized need to initiate and appropriately strengthen public health education in the country. Considerable investment in public health training is needed to create effective public health professionals. In 2012, the High Level Expert Group for Universal Health Coverage for India recommended strengthening health-sector management by supporting postgraduate courses in public health and hospital management for health professionals, and reiterated that health curricula in the country have not kept pace with the changing dynamics of public health, health policies and demographics. It recommended establishment of new public health management institutions in three phases: 2012–2015, 2015–2017 and 2017–2022. The High Level Expert Group also emphasized the immediate need to establish public health training institutions and strong partnerships with public health management training institutions. The National Health Policy 2017 built on this theme, by explicitly proposing creation of a public health management cadre in all states. The policy also advocates an appropriate career structure and recruitment policy to attract young and talented multidisciplinary professionals. Medical professionals would be expected to form a major part of this workforce, but professionals from diverse backgrounds, including sociology, economics, anthropology, nursing, hospital management, and communications, who have public health management training, should also be considered. The policy notes that states could decide to locate these public health managers, with medical and non-medical qualifications, in the same or different cadre streams within their directorates of health. Traditionally in India, medical colleges were the centres for creating public health professionals. In the last two decades, there has been a significant change in the way public health professionals are trained in the country. There has been a conscious shift towards the creation of schools of public health outside medical colleges, allowing non-medical personnel to acquire academic competencies in public health disciplines. Currently the Master of Public Health (MPH) programme is being offered by various institutions and universities under the minimum standards for a masters degree laid down by University Grants Commission regulations, 2003. In the absence of a formal body or council for regulating public health education, to date, there has been limited information on evolution, development and issues related to MPH programmes in India. To remedy this situation, a Task Force for Public Health Education of Sub-Group on Health Education and Training of UK–India Joint Working Group on Cooperation in the Field of Health has been constituted at the level of the Government of India, to work on developing a model MPH curriculum. The model programme of study will focus on skills related to analysis and assessment, policy planning and development, communication skills, financial planning, management and leadership. Two authors of the present paper (SZ and HN) are members of this taskforce. This paper reviews the current status of MPH programmes in India. Data regarding the existing MPH programmes were obtained using a two-step process originally used by Zodpey et al., and subsequently replicated in several research studies related to public health education.,, In the first step, a list of institutions offering MPH programmes in India was constructed. An internet search was conducted, using the Google search engine and keywords including “public health programmes”, “public health courses”, “Master of Public Health”, “MPH” and “schools of public health”. The search was limited to programmes offered in India and to collaborations between Indian and foreign institutions, if any. Only master's-level programmes of a minimum of 2 years' duration were included. For example, the Post Graduate Diploma in Health Science (Public Health) offered by Annamalai University, which is equivalent to a MPH of 1 year's duration, was not included, since the University Grants Commission regulations stipulate that a master's degree programme should be a minimum of 2 years' duration. The websites of the All India Council of Technical Education, University Grants Commission, and universities and institutions were also searched. In addition, education supplements of leading newspapers and education-based websites, including shiksha.com, targetstudy.com, getmyuni.com and career.webindia123.com, were searched. Experts in the field of public health education were also contacted and related literature was also identified through Google Scholar and PubMed. In the second step, detailed information about the MPH programmes was collected from the institutions and their websites. The admissions office, relevant departments and faculty of these institutions were contacted by telephone and email, to request information on the fee structures, number of student places, eligibility criteria, duration of the programme and programme details. Any other salient features of relevance to the programmes, such as the ownership, affiliation and geographical location of the institution, specializations offered (if any), or number of faculty for the MPH programme, were also collected. The information was incorporated into a matrix and the findings were triangulated wherever possible. The collated data were then analysed based on the year of launch of the MPH programme, the ownership, affiliation and geographical location of institutions, eligibility criteria, duration, specializations offered, number of faculty, intake capacity and enrolled numbers, and the accreditation/curriculum of courses. 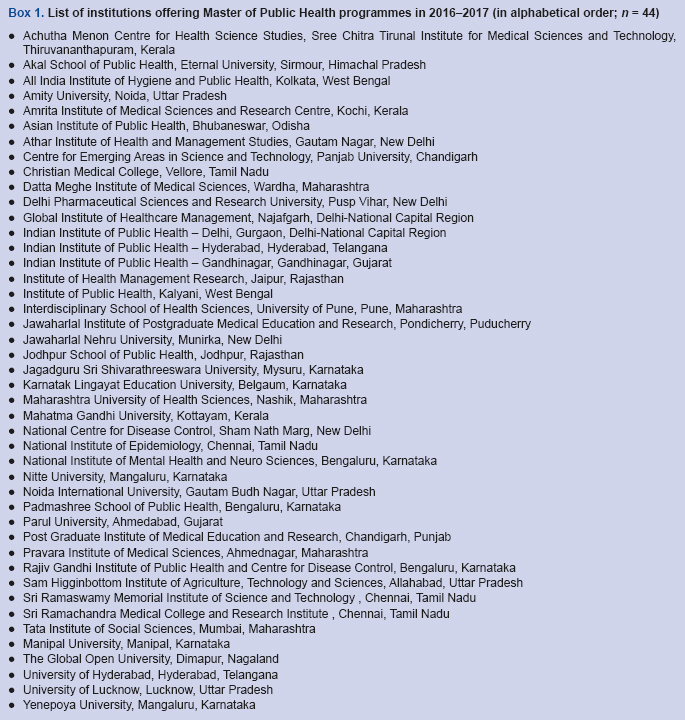 This scoping review identified 46 institutions that have ever offered a MPH programme in India. However, out of these 46, two institutions discontinued their MPH programmes from 2013 onwards. In the academic year 2016–2017, 44 institutions offered 46 MPH programmes (two institutions offered two different types of MPH programmes). Thus, for India in 2016–2017, there was one MPH programme in existence per 28.7 million population. Of these 44 institutions, 42 had at least one student enrolment in 2016–2017, whereas, two institutions had no enrolments. Findings on these 44 institutions and the 46 MPH programmes offered in 2016–2017 are summarized next. The first MPH programme in India was launched at Mahatma Gandhi University, Kottayam, Kerala, in 1995. This was followed by the Achutha Menon Centre for Health Science Studies, Sree Chitra Tirunal Institute for Medical Sciences and Technology, Kerala in 1997. During the decade from 1997 to 2006, four institutions commenced MPH programmes – Sam Higginbottom Institute of Agriculture, Technology and Sciences, Allahabad in 2000; the National Centre for Disease Control, New Delhi in 2005; and both Jawaharlal Nehru University, New Delhi and the Interdisciplinary School of Health Sciences, University of Pune, Pune in 2007. 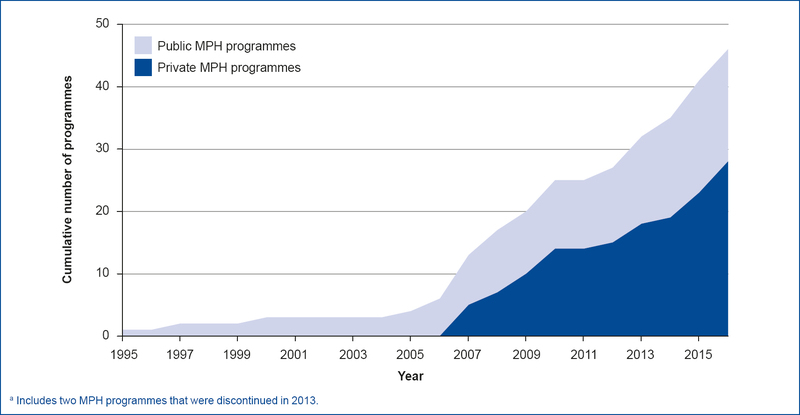 In the decade from 2007 to 2016, MPH programmes were launched by 40 institutions, including an upsurge in the number of private institutions offering MPH programmes (see [Figure 1]). MPH programmes offered at Birla Institute of Technology and Sciences, Pilani, Rajasthan and Chitkara University, Punjab were discontinued in 2013. Of the 44 institutions currently offering MPH programmes (see [Box 1]), 26 are privately owned and 18 are in the public sector. Tata Institute of Social Sciences offers two MPH programmes, one in social epidemiology and the other in health policy, economics and finance. Sri Ramaswamy Memorial University also offers two programmes: a MPH and a Master of Business Administration (MBA)/MPH dual degree. In terms of geographical location, eight institutions are situated in Karnataka; six in Delhi-National Capital Region; five in Maharashtra; four each in Uttar Pradesh and Tamil Nadu; three in Kerala; two each in Chandigarh, Gujarat, Rajasthan, Telangana and West Bengal; and one each in Himachal Pradesh, Nagaland, Odisha and Puducherry. The concentration of institutions offering the MPH is therefore mostly outside the Empowered Action Group states that are targeted for special government health and development assistance. MPH programmes in India are postgraduate-level courses aimed at building the human resources capacity in public health. Most of the MPH programmes provide opportunity to graduates from multidisciplinary medical backgrounds such as medicine, dentistry, physiotherapy, occupational therapy, AYUSH (ayurveda, yoga and naturopathy, unani, siddha and homoeopathy), nursing, veterinary sciences or pharmacy; and non-medical backgrounds such as engineering, statistics/biostatistics, demography, population studies, nutrition, sociology, economics, psychology, anthropology, social work, management, life sciences, social sciences, management, law, arts, etc., to enrol for the programme. In addition to these eligibility criteria, some institutions give preference to candidates with a prior health background, i.e. of working in health services. The eligibility criteria for MPH programmes are variable; for example, some institutions enrol AYUSH graduates in their MPH programmes, while some do not allow them to enrol, even though they are trained in health sciences. Of the 46 MPH programmes offered, 44 are of 2 years' duration. In addition, there are two 3-year programmes: Rajiv Gandhi University of Health Sciences, Karnataka's MPH (Honours)24 and Sri Ramaswamy Memorial University's MBA/MPH programme. Thirty institutions do not offer any specialization as part of their MPH programme, whereas 14 offer specialization in domains such as epidemiology, nutrition, health promotion and health management, maternal and child health, field epidemiology, community nutrition, health economics, financing and policy, health systems, and occupational and environmental health. All MPH programmes are taught on-campus, apart from the programme offered by the Global Open University, Nagaland, which is a distance-learning course. Course work covers standard fields of public health, including epidemiology, biostatistics, environmental health and health policy. Most on-campus programmes include teaching with practical/field experience. The faculty in most of the institutions have a multidisciplinary background. However, MPH programmes offered through medical colleges are predominantly taught by faculty with a medical background. Faculty numbers for MPH teaching were available for 41 institutions and ranged from 1 to 25, with a median of 6. The ratio of faculty number to student enrolments in 2016–2017 of these 41 institutions ranged between 1:0.1 and 1:42. Institutions with very minimal faculty, for example one, bring external faculty from other institutions to teach their programme. In the 2016–2017 academic year, out of 44 institutions, 1190 places were being offered on MPH programmes but only 704 students were enrolled. Two institutions had zero enrolments, 16 had fewer than 10 enrolments, 13 had 10–20 enrolments and 13 had more than 20 enrolments. At 59%, the place occupancy for MPH programmes in India compares poorly with that for the Bachelor of Medicine and Bachelor of Surgery (MBBS) qualification, which is anecdotally 95%. However, place occupancy for the Bachelor of Dental Surgery programme has recently reduced to around 50%. The number of students graduating from an Indian institution with a MPH degree can only be estimated. During 2007–2016, more than 4300 enrolments took place in MPH programmes in India. Assuming 95% of students successfully graduated from these MPH programmes, there have been around 4100 MPH graduates. Information on employment of MPH graduates was available for three institutions; 93% of MPH graduates were in some form of employment. Currently, no formal regulatory mechanism exists in the country for the accreditation of public health courses, including MPH programmes. In 2011, the National Commission for Human Resources for Health Bill was introduced, which included formation of a National Council for Human Resource in Health for the regulation and accreditation of health education. However, the bill has not yet been enacted. The curriculum of the MPH programmes is therefore variable, as these programmes are offered by different universities and institutions and no standard curriculum exists in the country. India is ranked in the bottom quarter worldwide in terms of overall SDG health index, and needs a well-trained public health workforce. Traditionally, in India, medical colleges were the centres for training public health professionals. However, this training has been criticized as failing to provide exposure and develop expertise in health management, administration and national health programmes. Of late, in public health education, there has been a shift from medical schools to public health schools. This is also occurring in high-income countries, such as the United Kingdom of Great Britain and Northern Ireland, where the need to develop a multidisciplinary public health specialist workforce has been recognized. Across the world, the number of schools offering public health programmes is growing, although some regions are less well supplied with higher education in public health disciplines than others. Brazil, an emerging economy with more than 40 schools of public health, probably now has one of the greatest concentrations of public health training programmes in the world, at one course per 5 million population. Although the situation in Brazil is not necessarily a “gold standard”, it is striking that in in India there was only one course per 28.7 million population in 2016–2017. The Association of Schools of Public Health of the United State of America (US ASPH) requires MPH programmes to include five core areas, namely, epidemiology, biostatistics, health management, behavioural and social sciences, and environmental and occupational health, together with other modules that are integral for acquiring public health competencies. Faculty qualified to teach these core and supplementary areas are essential for MPH programmes in India. The first step for some institutions will be to recruit the appropriate number of appropriately qualified faculty. The University Grants Commission of India recommends that the faculty:student ratio should be between 1:15 and 1:10 for postgraduate-level programmes, to ensure teaching quality and rigour. The faculty:student ratio in MPH institutions in India for 2016–2017 ranged between 1:0.1 and 1:42. Thus, for MPH programmes there is a need to maintain a faculty:student ratio of at least 1:15. In turn, there is a need to generate a faculty pipeline by, for example, starting PhD and DrPH programmes in public health. Similar to the finding of this study of the low occupancy of places on MPH programmes in 2016–2017, prior work undertaken by the Public Health Foundation of India found that in 2011, 23 institutions in India offered MPH programmes with 5–15 enrolments per academic year. In 2010, out of 573 places, only 430 candidates enrolled in a MPH programme, which indicates a place occupancy of around 75%. Currently the enrolment into MPH programmes is lower in percentage terms than the enrolments in 2011. The number of MPH places available has already doubled from approximately 573 (23 institutions in 2011) to 1190 (44 institutions in 2016–2017). It would therefore be more appropriate to focus on enhancing enrolments to existing MPH programmes rather than launching new MPH programmes. Currently, the Medical Council of India (MCI) and Indian Nursing Council (INC) regulate only those courses that are offered through medical and nursing schools respectively. The current MPH programmes are regulated by the university that grants the master's qualification. As with the MCI and INC, a council or professional body for public health courses is needed for accreditation of MPH programmes in India. This professional body would develop a system for determining and certifying minimum standards of education for the different occupations and professions in the health system. Accreditation of public health programmes will lay standards for regulation for high-quality academic standards, responsiveness and ethical practices for public health education in India. In 2006, the US ASPH identified core competencies for the MPH programmes in the USA. Similarly, the public health community in India needs to develop and adopt a MPH competency framework tailored to the public health needs of India. In 2010, Sharma et al. proposed that MPH graduates in India must have competencies such as: monitoring of health problems and epidemics in the community, applying biostatistics in public health, conducting action research, understanding social and community influences on public health, developing indicators and instruments to monitor and evaluate community health programmes, developing proposals, and involving the community in planning, delivery, and monitoring of health programmes. Professionals with skills in monitoring and evaluation (M&E) are essential in public health systems, yet M&E capacity in many low- and middle-income countries is lacking. In 2013, Negandhi et al. used a group consultation involving institutions from Bangladesh, India, Nepal and Sri Lanka to identify a set of 15 core competencies for M&E training relevant to the south Asian context. Work on a public health competency framework has also been undertaken by Pandav et al., to standardize the core and cross-cutting public health training needs of medical undergraduates in India. There are no imperatives or incentives for institutions that offer MPH programmes in India to collaborate or share resources. Each individual institution effectively functions alone. A culture of collaboration among these institutions would encourage a sharing of best practices in tuition and development of teaching materials, and widen the faculty resource pool. For example, in the past the Indian Public Health Association, with support from the World Health Organization Country Office for India convened an expert group to draft a competency framework for public health professionals in India. Currently, MPH graduates in India are employed in the public, private and nongovernmental sectors, in teaching, research and implementation roles. However, there are no well-defined career pathways, which is a significant barrier for MPH graduates who wish to work in the public health sector. As noted earlier, the National Health Policy 2017 has proposed creation of a public health management cadre in all states, with a qualification in public health or related discipline as an entry criterion. The policy also advocates an appropriate career structure and recruitment policy to attract young and talented multidisciplinary professionals. The number of MPH programmes in India has expanded rapidly in the past two decades. This growth on the supply side is not yet matched by an increased demand for these graduates. Advertisements for managerial positions in the National Health Mission, such as state programme managers, district programme managers and block programme managers, should list a public health qualification like MPH as an essential or desirable qualification. Opportunities are slowly emerging for MPH graduates in the private sector, which has witnessed a growth in public health activities through corporate social responsibility programmes. Opportunities for MPH graduates in sectors such as pharmaceuticals and information technology are also increasing. MPH graduates with strong quantitative skills will be ideally suited to work in health-related “big data” initiatives. In addition, more graduates with public health qualifications and skills are needed within the development sector, which is increasingly involved in the public health arena. Despite the overwhelming need to strengthen India's public health workforce, MPH programmes are currently undersubscribed. Enrolled MPH students are not currently trained according to an explicitly stated, standardized competency framework that is tailored to the Indian context. Increased clarity on the role of MPH graduates in India's public health infrastructure would help institutions to adjust their programmes and ensure graduates are equipped with the required skill-sets. These, and other activities discussed in this paper, are essential to overcoming the shortage of public health professionals and meeting the development goals for India. Authorship: All authors were involved in the overall study design. RT conducted the literature review and collected and analysed the data. RT also wrote the first draft of the manuscript; this was reviewed and commented upon by HN and SZ, who reviewed it critically for important intellectual content. Ahoobim O, Altman D, Garrett L, Hausman V, Huang Y. The new global health agenda: universal health coverage. New York: Council on Foreign Relations; 2012. (http://apps.who.int/medicinedocs/documents/s19221en/s19221en.pdf, accessed 25 January 2018). United Nations. Sustainable Development Goals: 17 goals to transform our world (http://www.un.org/sustainabledevelopment/, accessed 25 January 2018). Hazarika I. Health workforce in India: assessment of availability, production and distribution. WHO South-East Asia J Public Health. 2013;2(2):106–12. doi:10.4103/2224-3151.122944. Gebbie KM, Rosenstock L, Hernandez LM. Who will keep the public healthy? Educating public health professionals for the 21st century. Washington (DC): National Academy of Sciences; 2003 (https://www.nap.edu/read/10542/chapter/1, accessed 25 January 2018). Working together for health. The world health report 2006. Geneva: World Health Organization; 2006 (http://www.who.int/whr/2006/whr06_en.pdf?ua=1, accessed 25 January 2018). Zodpey SP, Sharma K, Negandhi H. Public health education initiatives in India. Delhi: Public Health Foundation of India; 2011. High Level Expert Group report on universal health coverage for India. New Delhi: Planning Commission of India; 2011 (http://planningcommission.nic.in/reports/genrep/rep_uhc0812.pdf, accessed 25 January 2018). National Health Policy 2017. New Delhi: Ministry of Health and Family Welfare, Government of India; 2017 (http://cdsco.nic.in/writereaddata/National-Health-Policy.pdf, accessed 25 January 2018). Negandhi H, Sharma K, Zodpey SP. How can departments of community medicine shape the future of Public Health Education in India? Indian J Public Health. 2010;54(4):184–9. doi:10.4103/0019-557X.77257. UGC (Minimum Standards of Instruction for the Grant of the Master's Degree through Formal Education) Regulations, 2003. New Delhi: University Grants Commission; 2003 (https://www.ugc.ac.in/oldpdf/regulations/masterdegree_regulation.pdf, accessed 25 January 2018). Task Force for Public Health Education of Sub-Group on Health Education and Training of UK–India Joint Working Group on Cooperation in the Field of Health. New Delhi: Ministry of Health and Family Welfare, Government of India; 2017. Zodpey S, Negandhi H, Tiwari R. Mapping ‘Occupational Health’ courses in India: a systematic review. Indian J Occup Environ Med. 2009;13(3):135–40. doi:10.4103/0019-557X.77257. Hasan H, Sharma K, Zodpey S. Emerging landscape of the pharmaceutical management education in India. J Health Manag. 2012;14(2):141–50. doi:10.1177/097206341201400204. Eduvark.com. MPH Distance Learning Annamalai University (http://eduvark.com/mph-distance-learning-annamalai-university-71143.html, accessed 25 January 2018). University Grants Commission. Specification of degrees. New Delhi: The Gazette of India; 2014 (http://www.iiserbpr.ac.in/vacancies/UGC%20approved%20Degrees.pdf, accessed 25 January 2018). shiksha. Empowering millions of students in making the right career and college decision (https://www.shiksha.com/, accessed 25 January 2018). TARGETSTUDY. Education. Knowledge. Career (https://targetstudy.com/, accessed 25 January 2018). GETMYUNI (https://www.getmyuni.com/, accessed 25 January 2018). webindia 123. Education and career (https://career.webindia123.com/, accessed 25 January 2018). Sharma K, Zodpey S. Public health education in India: need and demand paradox. Indian J Commun Med. 2011;36(3):178–81. doi:10.4103/0970-0218.86516. Sharma K, Zodpey S, Negandhi H, Morgan A. Contextualizing Indian Masters of Public Health (MPH) programmes – challenges and the way forward. South East Asian Journal of Medical Education. 2014;8(1):21–30 (http://imsear.li.mahidol.ac.th/handle/123456789/166184, accessed 25 January 2018). Master of Public Health (Honours) Course. Information brochure. Karnataka: Rajiv Gandhi Institute of Public Health and Centre for Disease Control; 2017 (http://rguhs.ac.in/inst_pubhealth_rguhs/Brochure.pdf, accessed 25 January 2018). Master of Public Health (MPH). Postgraduate programme. Kancheepuram: SRM University School of Public Health; 2017 (http://www.srmuniv.ac.in/downloads/mph_brouchure.pdf, accessed 25 January 2018). Masters of public health programmes in India. New Delhi: Public Health Foundation of India; 2011. The National Commission for Human Resources for Health Bill, 2011. New Delhi: Ministry of Health and Family Welfare, Government of India; 2011 (http://www.prsindia.org/administrator/uploads/media/National%20Commission%20for%20human%20resources%20bill/National%20commission%20for%20human%20resources%20bill,%202011.pdf, accessed 25 January 2018). SDG index and dashboards. A global report. New York. Bertelsmann Stiftung and Sustainable Development Solutions Network; 2016 (http://www.sdgindex.org/assets/files/sdg_index_and_dashboards_compact.pdf, accessed 25 January 2018). Bangdiwala SI, Tucker JD, Zodpey S, Griffiths SM, Li L-M, Reddy KS et al. Public health education in India and China: history, opportunities, and challenges. Public Health Reviews. 2011;33(1):204–24. doi:10.1007/BF03391628. Garg R, Gupta S. Are we really producing public health experts in India? Need for a paradigm shift in postgraduate teaching in community medicine. Indian J Community Med. 2011;36(2):93–7. doi:10.4103/0970-0218.84124. Evans D, Dowling S. Developing a multi-disciplinary public health specialist workforce: training implications of current UK policy. J Epidemiol Community Health. 2002;56(10):744–7. doi:10.1136/jech.56.10.721. White F. The imperative of public health education: a global perspective. Med Princ Pract. 2013;22(6):515–29. doi:10.1159/000354198. How Brazil turned one public health school into 40. Bull World Health Organ. 2007;85(12):912–3. doi:10.2471/BLT.07.101207. Calhoun JG, Ramiah K, Weist EM, Shortell SM. Development of a core competency model for the master of public health degree. Am J Public Health. 2008;98(9):1598–607. doi:10.2105/AJPH.2007.117978. UGC considers new norms for teachers student ratio. New Delhi: Press Information Bureau, Ministry of Human Resource Development, Government of India; 2011 (http://pib.nic.in/newsite/PrintRelease.aspx?relid=71090, accessed 25 January 2018). Meghe SD, Zahiruddin QS, Gaidhane A, Behere PB. Masters of public health education in India: Current scenario and future prospect. The Health Agenda. 2013;1(4):99–103 (http://citeseerx.ist.psu.edu/viewdoc/download?doi=10.1.1.707.179&rep=rep1&type=pdf, accessed 25 January 2018). Sharma K, Zodpey S, Gaidhane A, Syed ZQ, Kumar R, Morgan A. Designing the framework for competency-based master of public health programmes in India. J Public Health Manag Pract. 2013;19(1):30–9. doi:10.1097/PHH.0b013e318241da5d. Negandhi H, Negandhi P, Tiwari R, Sharma A, Zodpey S, Kulatilaka H et al. Developing core competencies for monitoring and evaluation tracks in South Asian MPH programmes. BMC Med Educ. 2015;15(1):126. doi:10.1186/s12909-015-0403-5. Pandav C, Zodpey S, Negandhi H, Yadav K, Salve H, Kumar R. Competency based public health training in undergraduate medical education – much needed paradigm shift in India. South East Asian Journal of Medical Education. 2016;10(1):4–12 (http://seajme.md.chula.ac.th/articleVol10No1/CP1_Pandav_Zodpey.pdf, accessed 25 January 2018). Zodpey SP, Negandhi H, Yeravdekar R. Future directions for public health education reforms in India. Front Public Health. 2014;2:68. doi:10.3389/fpubh.2014.00068. Sharma K, Zodpey S, Syed Z, Gaidhane A. Career opportunities for master of public health graduates in India. Asia Pacific Journal of Health Management. 2013;8(1):45–50 (https://achsm.org.au/Documents/Vol%208%201%20Final%20Career%20Opportunities%20for%20Master%20of%20Public%20Health%20Graduates%20in%20India4fab.pdf, accessed 25 January 2018).